For this cake I used an 8 and 10 inch round cake pan. I covered cake with butter cream icing. I used about 2 lbs of rolled fondant. Heat it in the microwave for about 10 seconds to soften, then blend in food coloring until you have the color you desire. Roll out fondant on a clean surface using icing sugar or cornstarch to prevent the fondant from sticking. Roll fondant around rolling pin to transfer to the 10inch cake, once you have done so, smooth out fondant and trim off access fondant from the bottom of the cake. Do the same to the 8 inch cake then place on top of the 10 inch cake. I decorated the cake using fondant cut outs. To place them on the cake, wet down the pieces with water using a very small pastry brush, then place on the cake. 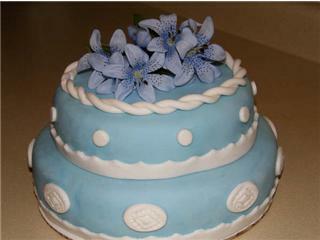 For the braid on the top, just roll out fondant with your hands until you form a long string. Make 2 of them and braid together. Dampen the ends with water so they stay together and place on top of the cake. I also laid silk flowers on the top of the cake.